Ubisoft announced today that Trackmania Turbo will be playable in an open beta that will begin at 9 am ET on March 18 and run until 9 am ET on March 21. Unfortunately, and surprisingly, the beta is for “new-gen consoles” only, those being the Xbox One and PlayStation 4. But the PC crowd isn't being left out in the cold entirely. 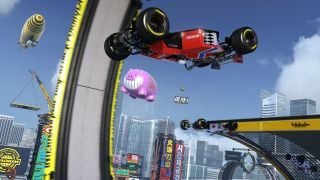 But Trackmania also has a history of providing free demos—the Stadium, Canyon, and Valley freebies—and Trackmania Turbo will follow that tradition as well. “PC players will be able to discover the game through a free trial that will be available once the game has launched,” the rep said. How exactly the trial will work, whether it will be time-limited or offer a small selection of tracks or do something else entirely, wasn't explained, but past demos have been pretty generous and I would hope that this one will be too. Trackmania Turbo will be out on March 25.